Overland - A family tackles Northern Ontario in ‘Cloudy with Chance of Doom’ in an attempt to fulfill a fathers dream; and join us as we travel with a couple to experience the earth’s four extremes - the hottest, the highest, the lowest, and the coldest places on land. Secrets - Manufacturers keep their new products under wraps until SEMA, the largest aftermarket vehicle product launch in the world. We show you some today, AND our long term reviews of essential trail and overland gear to keep you rolling. 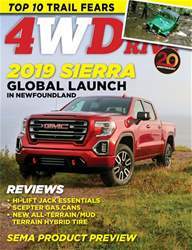 The Irregulars - a club shares a surprising trail ride in ‘A Sea of Mud’, our tech department shows how easy it is to switch your carbureted engine to EFI, a Trail Leader shares his Top 10 Fears and we showcase some Readers Rides - maybe one is yours! New trucks - Should Land Rover Defender lovers rejoice over the news of the resurrection? We’ll share what we know and what we expect. 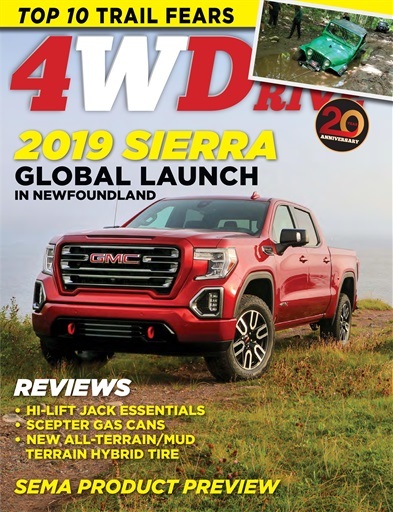 Speaking of what we know - experience the new 2019 Sierra as we drive across Newfoundland on the global launch of this new truck.